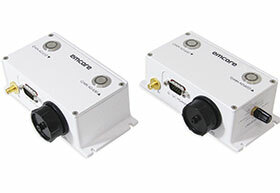 The EMCORE 5200 series fibre-optic inter-facility link (IFL) is a cost-effective alternative to coaxial cable for 20 MHz up to 6500 MHz communications applications. The devices function as transparent RF fibre links, eliminating the limitations of copper systems by enabling longer transmission distance while retaining a high level of signal quality. They also provide network advantages such as simplified network design, ease of installation, and immunity from EMI/RFI and lightning. The 5200 series can be used in wireless, headend, TVRO and broadcast applications, among others. Its compact design allows for four units to fit into a 1RU chassis.